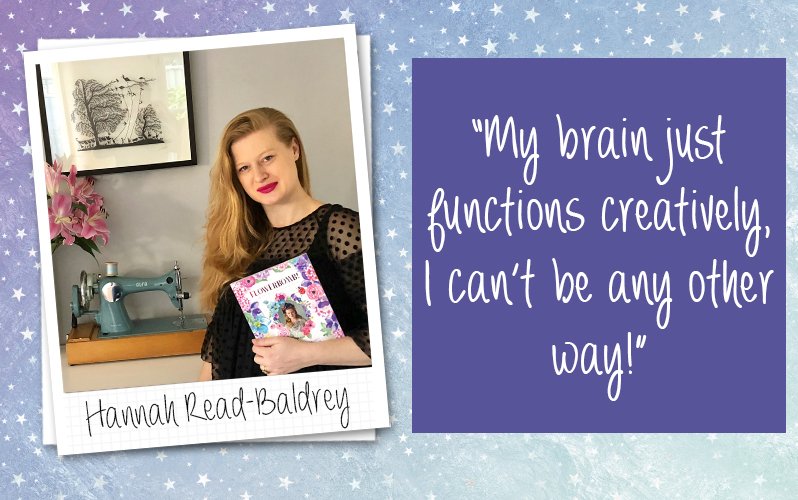 Blog | January 2018 | Meet the Blogger – Hannah Read-Baldrey, plus chance to WIN a signed copy of Flowerbomb! Meet the Blogger – Hannah Read-Baldrey, plus chance to WIN a signed copy of Flowerbomb! It’s time to meet stylist, craft author and fan of Trimcraft products, Hannah Read-Baldrey, the creative mind behind Couture Craft! Hannah runs her own blog and can be found showing off her wonderful designs, interiors and bakes on her Instagram account (@CoutureCraft). We spoke to Hannah about her life as a cool craft blogger, as well as her new craft book Flowerbomb! Read on to the end of the article to be in with a chance of winning a signed copy! How long have you been a craft blogger? I started blogging over 10 years ago, initially as I was staring out as a stylist and had to supplement my salary by temping in between freelance jobs. It was something I could do whilst on a computer and no one could check up on what I was up to! What kind of posts will we find on your blog? I love craft and baking, homes and interiors ideas as well as fashion. But mainly craft and baking! I wanted to create a blog that represented the high-end side of craft and at the time move away from the “granny” reputation it once had. Hence the name Couture Craft. What is the best thing about being a craft blogger? I have a true obsession for craft products, I love seeing new things and I love sharing my constant stream of ideas. If you could design any craft product, what would it be? I would love to design floral wedding kits! My latest book Flowerbomb! 25 crafts to blow your blossoms, will be out on the 1st February and it’s filled with gorgeous floral ideas for the home, fashion and parties. I’m actually working on some kits to run alongside the book for later on in the year. What is your favourite Trimcraft Product and why? I do love the papers, but recently (for the FlowerBomb! book) I had fun with the Dovecraft embossing gun to create some stationery ideas. What is an average day like as a blogger? I have a varied time as I work as a stylist and presenter as well as being a mum. I try to blog as much as I can and actually doing those other things enhances what I do. When I’m blogging, I generally come up with ideas at my dining table or in my kitchen and photograph then post them online. I Iove seeing people’s reactions to my posts, which I generally get most of on Instagram (@couturecraft). My brain just functions creatively, I can’t be any other way! I’m inspired by all sorts of things, the flowers that come with each season, music, museum exhibitions, buildings, fashion (I adore Vivetta, Marhcesa, McQueen and Dolce & Gabbana). It comes from all around. I love Brit+Co, I Spy DIY, The Hobbycraft Blog… gosh there are so many to choose from! Offer me two… I do live in London! I would do up a large house and set up my own workshop/shop business. I’m pregnant! I’m due mid-April! You can find Hannah’s blog at CoutureCraft.co.uk, styling website at HannahReadBaldrey.com and Instragram @couturecraft for more inspiration! Flowerbomb! by Hannah Read-Baldrey is published by Pavilion. Photographs by Tiffany Mumford. Win a signed copy of Flowerbomb! We’re giving one lucky crafter the chance to WIN a signed copy of Hannah’s new book, Flowerbomb! Terms and conditions. All entries must be received by 9am on the competition closing date and is open to all UK and Europe residents aged 16 or over, excluding employees or agents of the associated companies and their families. Only one entry per household. Prize contents are subject to change. No cash alternative. One prize will be given away to a member drawn at random on the closing date. Registration via www.thecraftblog.com is a pre-requisite to entry. Registration is free. No purchase necessary. The decision of the judge is final and no correspondence will be entered into. The winner will be notified by email. The winner’s name and website username will be available by sending a SAE marked Trimcraft Competition to Claire Brudenell, Trimcraft, Bishop House, Abbeyfield Court, Abbeyfield Road, Nottingham, NG7 2SZ, UK. Your details will be processed by Trimcraft (Nottingham) Ltd in accordance with data protection legislation. WIN FLOWERBOMB I can’t wait for this book and have it on pre-order but I’d love to be able to gift a copy to an equally flower obsessed crafter. It makes me excited for spring already!! ‘WIN FLOWERBOMB’ What an amazing lady and such fabulous thing, she´s creating too. And her book looks really exiting and inspiring too, so I´ll definitely cross everything possible to be the lucky one here ha ha ha. But best of luck to all, as I´m sure we´ll all love to win this, and thanks sooo much for the chance. Have a great week everyone.